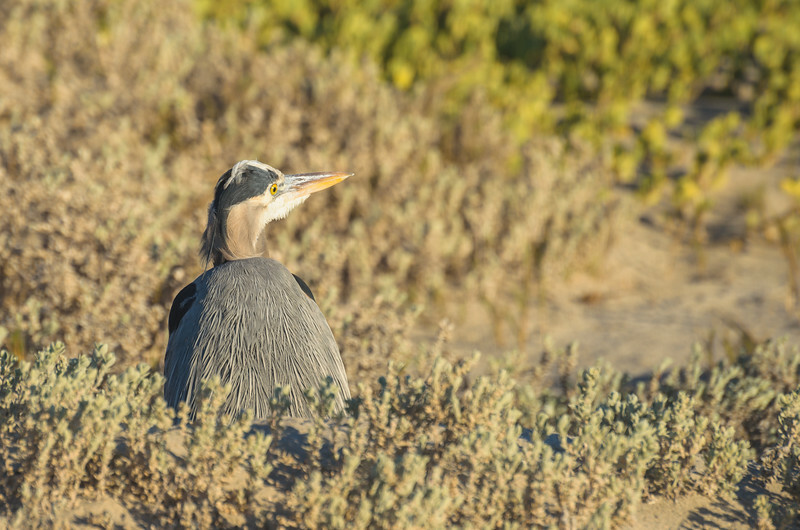 During my recent sojourn up north, I came across this very docile guy in the dunes along the beach below Ellwood Mesa in Goleta. I tossed my telephoto lens on the camera and took a series of shots, the one above being my favorite. The bokeh -- the out-of-focus part of the photo -- might be a tad better. I'm not sure if that's a product of the Nikon 70-300mm lens, the lighting, my using it on a DX (cropped sensor camera) or a poor shooting decision on my part. 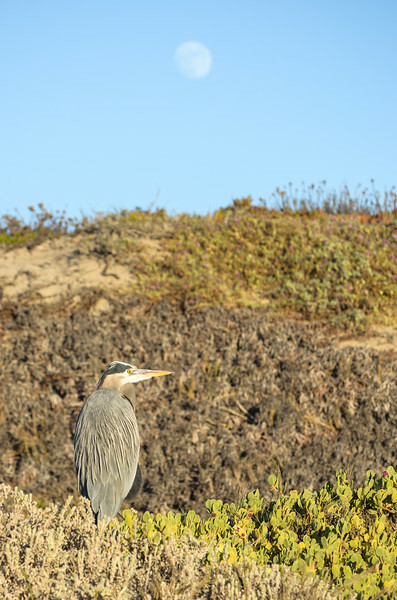 I shot the above photo at f/8 in order to ensure the entire heron was in focus. Maybe the bokeh looks a little better if I had opened the aperture a little more. I do like the lens -- I got mine used for about $470 and it's very sharp when properly focused, although there have been a few other times the bokeh could have been better. I suspect the bokeh is the product of all of the above. It's not a deal killer but something to keep in mind when framing shots. This one isn't bad but really only works if printed very large because the heron is small within the frame. A pretty decent shot, too -- and the purple wildflowers in the background add a nice splash of color. But the bird's pose seems like something in a gazillion other photographs. The pose in the top photo is more original. Please check out more of my photos on my SmugMug site. Interested in buying a print? More info here. And please follow me on Twitter. Someone has to.